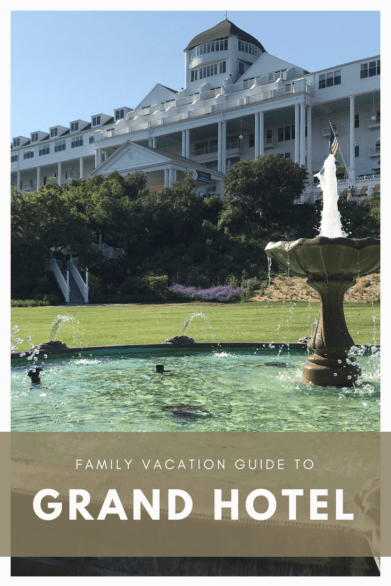 If you’re planning a family vacation to Mackinac Island, there’s a good chance you’ve heard of the Grand Hotel. It’s won a ton of awards over the years, and have been included in countless lists like Travel + Leisure’s Best All-Inclusive Hotels in 2018. 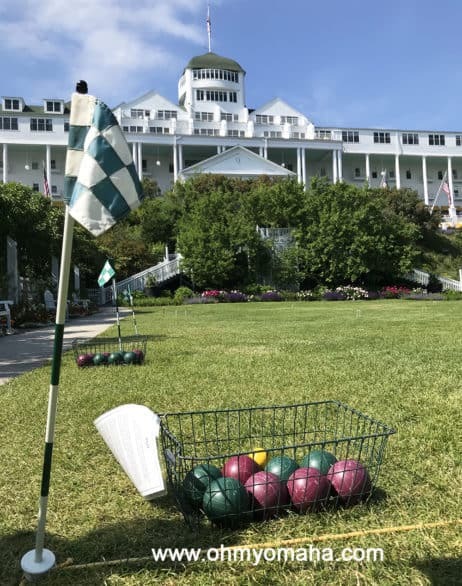 So, what’s it like to stay overnight at the Grand Hotel with kids? 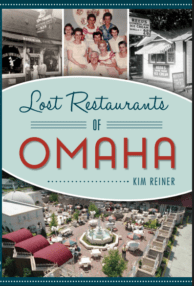 I’ve stayed there this summer and wrote about my family’s experience. It’s a tough job, but someone has to do it. Disclosure: My visit was hosted by the Grand Hotel. All thoughts, opinions and typos are my own. The Grand Hotel is so large, it’s easy to spot from the ferry as you make your way to Mackinac Island, Mich. 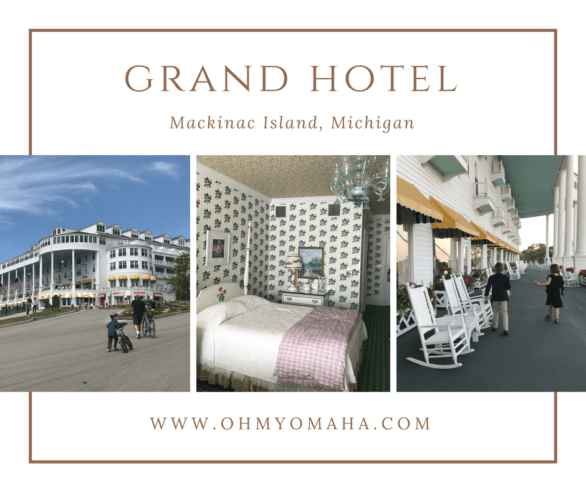 The Grand Hotel is a luxury, all-inclusive resort on the car-free island, Mackinac Island, located in the Upper Peninsula of Michigan. It’s a National Historic Landmark that dates back to 1887. It’s impressive. It’s full of tradition, like Afternoon Tea in the Parlor and dressing up for dinner. There are several levels of rooms to book at the Grand Hotel, plus some suites. Each of the 393 rooms has its own unique look. Each room is exquisitely decorated. I swear, every detail in this hotel is exquisite, so I’m not surprised the each room has an artistic touch. Our Category I room at the Grand Hotel included two queen size beds and an interior view. It was large enough to accommodate a family of four. 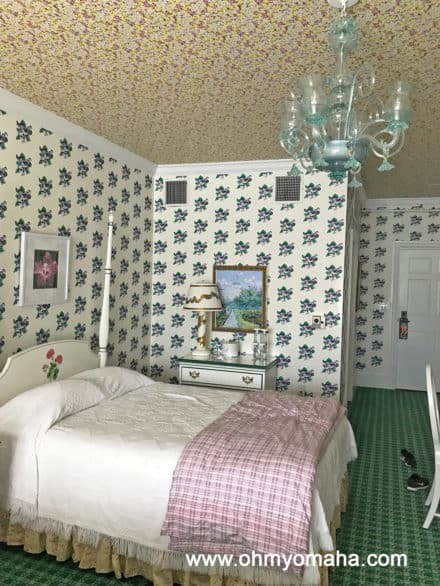 The interior designer Carleton Varney of Dorothy Draper & Co. decorated the hotel and its rooms. We stayed in a Category I room, meaning it was smaller and had an interior view (AKA, it overlooked a roof and another wing of the hotel). Category II is a higher price point and means you either get a larger room with an interior view or a smaller room with a lake view. Category III is yet a high price point, and included a deluxe room with a view (some have balconies). See all the room options here. Most room rates include breakfast and dinner; the Full American Plan also includes the Grand Luncheon. The good news is that kids 9 and younger stay for FREE at the Grand Hotel. Obviously, they’ve seen how little my kids eat. j/k If you have a child between ages 10 and 17, the rate is significantly lower for him or her, too. Our room at the Grand Hotel was a Category I, meaning it was smaller than others and had an interior view instead of lake view. On the plus side, it was a lower price and still included all the meals. Our Category I room was quite comfortable for our family of four. We didn’t spend a whole lot of time in the room, anyway, so the we did not require something more spacious. The amenities, by the way, were quite luxurious and smelled wonderful. I may have pocketed the lotion. The price you pay for your Grand Hotel room covers most meals – the full breakfast and dinner. 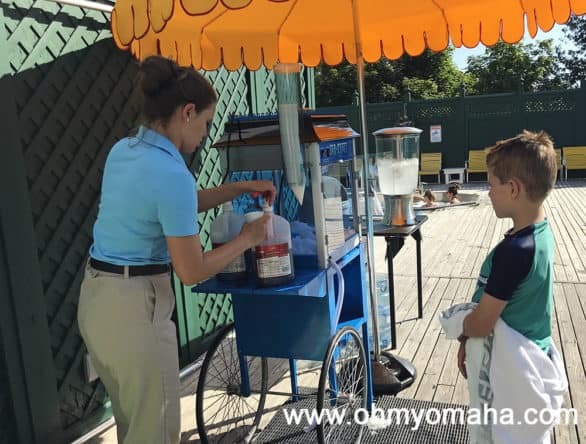 There are more than one restaurant on hotel grounds where you can dine at with your family. 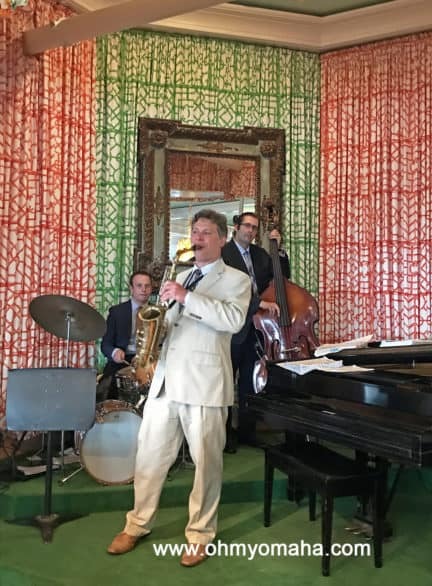 There was live music in the Main Dining Room during dinner at the Grand Hotel. During our visit, we had breakfast and dinner in the Main Dining Room. This was quite the experience! First, let’s talk about breakfast. Kids and adults order from the same menu at breakfast, plus there’s the option of going to the buffet. The kids opted for the buffet, but both me and Mr. Wonderful wanted to try all the great stuff on the breakfast menu. I had a bagel and lox, plus a berry salad topped with homemade whipped cream. Part of my breakfast was a berry salad topped with homemade whipped cream. Breakfast was the most casual of all meals. It was a little frustrating to watch my kids grab a single-serve box of Fruit Loops when there was an abundance of dishes, fresh fruit and pastries to choose from. If your kid has a similar palate, brace yourself to bite your tongue. Dinner is an experience not to be missed at the Grand Hotel. I prepped the kids ahead of time, explaining expectations and how there was a dress code for dinner. They loved the idea of dressing up, surprisingly, and getting ready went without a hitch. The kids in their dinner clothes – a suit coat and slacks and a little black dress. 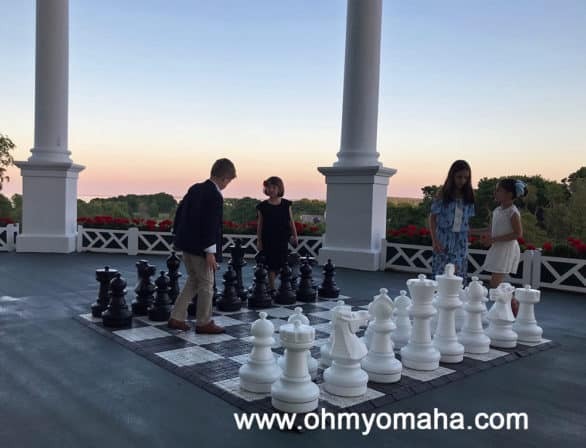 After dinner, they wanted to play with the giant chess board on one end of the Grand Hotel’s porch. There was a kid’s menu for dinner, though both kids preferred to head straight to the buffet. Again, Mr. Wonderful and I ordered from the menu and enjoyed an elaborate five-course dinner. There’s a lot of activity in the Main Dining Room at dinner time. The live music was a nice touch, and the kids loved watching waiters come and go. One carried a tray on his head, much to the delight of every kid in the dining room. 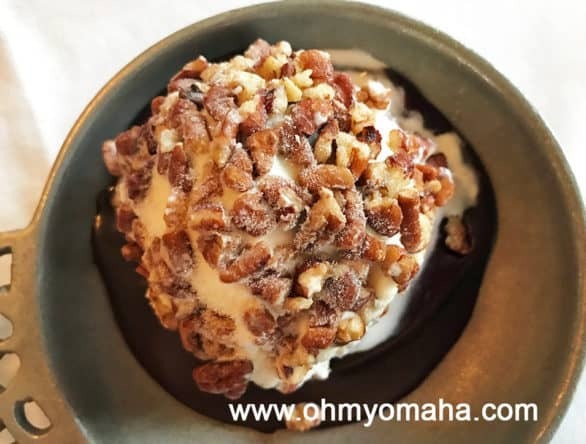 The famous pecan ball at Grand Hotel. I ordered it for dessert the night we were there. Don’t leave the dining room before you had a chance to try it. I’d mentioned before that there were other restaurant options at the Grand Hotel. There are a few not on hotel grounds. If you dine at one of them (I mentioned The Woods in this post), know that the dining plan probably doesn’t cover a full meal but, instead, covers a portion of the dinner. There is also a daily afternoon tea that is an additional price. It runs from 3:30 to 5 p.m. I skipped it on our visit, but then passed through the lobby as it was occurring and regret it terribly. The desserts looked delicious and there was a harpist performing during the meal. It looked utterly charming, and I would book it in a heartbeat to attend with my daughter if we return. 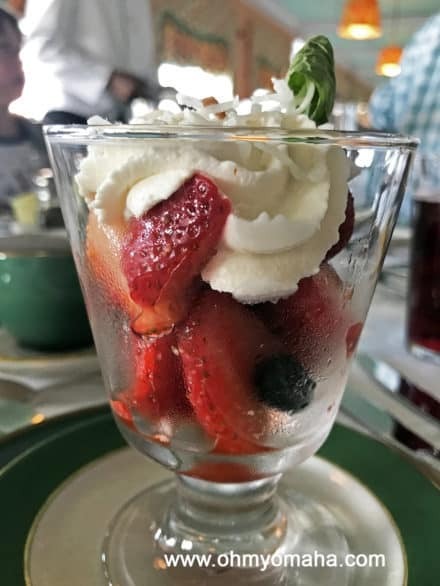 You can’t really stay at the Grand Hotel and skip visiting Sadie’s, the ice cream shop on the ground floor, especially if you are staying at the hotel with kids. Read the next section to see how your kids can get a FREE scoop of ice cream there. We traveled all over Michigan for more than a week, and the highlight of the entire road trip? The Grand Hotel’s pool. It ranked that high in my kids’ memory. The Grand Hotel’s pool was the largest my kids have seen. There were inflatables available and goggles for kids to use. The Esther Williams Swimming Pool is quite large, with two hot tubs to boot. It gets its name because the movie star filmed a movie at the hotel long ago. Anyway. The big draw for my kids, though, were the collection of colorful floaties and pool toys that were free for guests to use. Pool staff was also handing out free sno cones to kids on the day we were there. Pointing it out to my kids was the only way I could get them out of the pool. Cooling off after a swim with a complimentary sno cone at the Grand Hotel. One things to note: This is an outdoor pool and it is a bit of a trek from the hotel building. Bring pool shoes or flip flops, plus a cover up if you think your family is going to be taking a dip in the pool. And you’ll want that cover-up if you close down the pool, too. The pool closes at 6 p.m., which also happens to be the time when the formal dress code starts to apply in certain lobbies. I was a bit self-conscious returning to the hotel with the kiddos when everyone else was strolling around in chic clothes. We rented bikes from the Grand Hotel and took an 8.5-mile, self-guided tour around the island. They had kid-sized bikes plus tagalong attachments. The bike ride was one of my favorite parts of our visit to the island. You can rent bikes from the Grand Hotel on Mackinac Island. 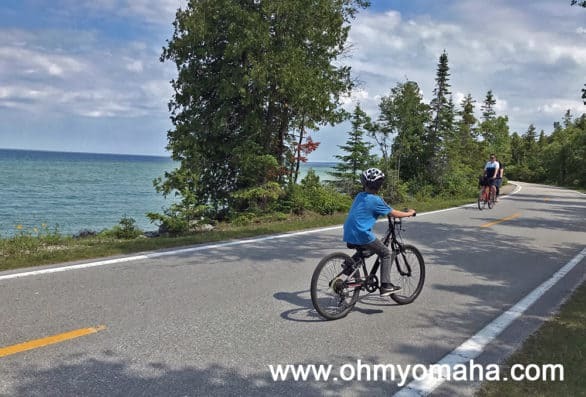 You can ride around the island via the state highway, a large, paved, two-lane bike path that’s mostly flat and along the beautiful lakeshore. The hotel has an excellent health program courtesy Blue Cross Blue Shield. Kids get a card at check-in, and if they complete at least five activities, they receive a FREE scoop of ice cream at Sadie’s. The scoop, mind you, is huge. Activities include swimming at the pool, taking a bike ride, playing a round of FootGolf and playing chess on the porch. Some activities were an additional fee. My kids had no problem completing the needed activities during our brief stay. Given our short timeframe of staying, we did not take part in any of the complimentary children’s programs at the Grand Hotel. These programs are held daily on hotel grounds and include drop-off options for kids ages 5 and older. 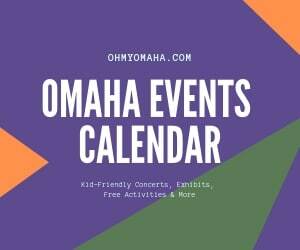 In 2018, the program runs from June 2 through Aug. 31. All kids programs at the Grand Hotel start and end in this room located near the hotel’s arcade. Evenings – Chicken dinner, ice cream at Sadie’s and FootGolf (Mondays), dinner in the Main Dining Room and arcade games (Tuesdays), pizza and movie night (Wednesdays), dinner in the Main Dining Room and story telling games (Thursdays), dinner at The Gate House and school yard activities (Fridays), sandwich buffet with arts & crafts and ice cream sundaes (Saturdays), and dinner in the Main Dining Room and bingo (Sundays). Kids aren’t the only ones with activity options. 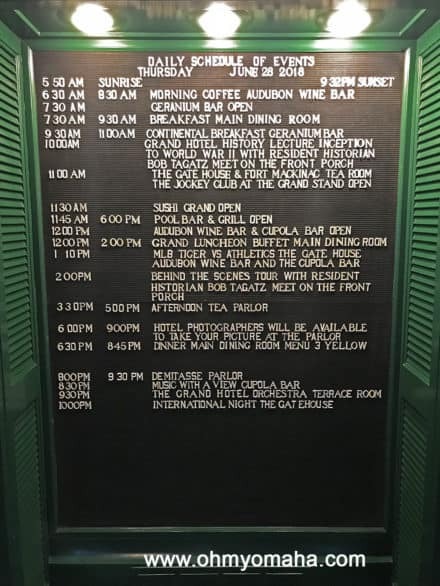 The list of daily activities is found in the lobby and a paper version is delivered to your room each day. There were also a number of activities for adults. No doubt, if we were staying longer at the hotel, we would’ve registered the kids for one of the programs and joined in one of the activities for adults scheduled at the hotel. What an easy way to sneak in a date night while on vacation! In the words of my 8-year-old, “This is one classy place.” Staying here has been on my bucket list for more than a decade, so the expense, in my opinion, is worth it. But I can see how it could be difficult to justify the expense if you have a large family. The view of the Grand Hotel from the lawn. Having said that, meals are included and there were a good variety of complimentary activities. Having dined elsewhere on the island, I have an idea how much we’d spend as a family having dinner out, so having it included is a selling point to me. If we had another day or two at the hotel, I would’ve felt comfortable registering the kids for one of the daily programs. 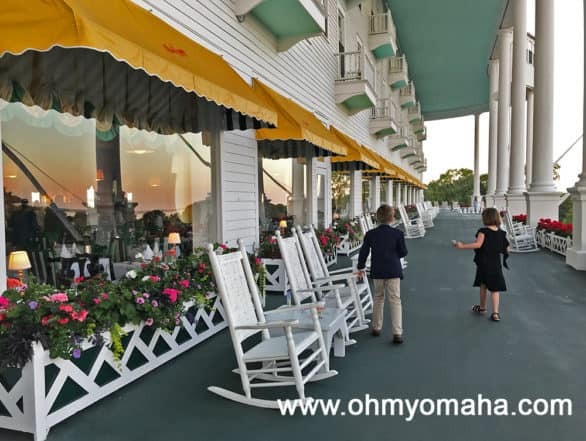 This would have allowed a couple hours for me and my husband to chill out together, either taking a walk or having a drink at the hotel’s wine bar (or on that spectacular porch). 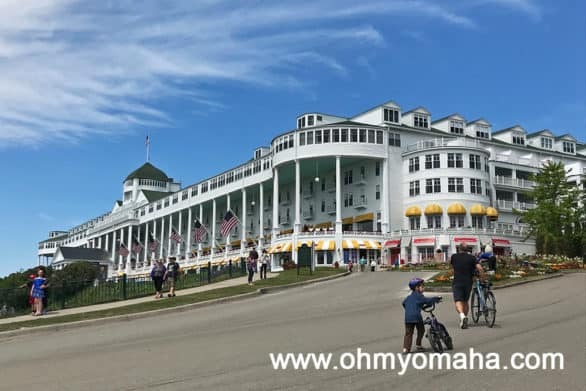 If you can budget a stay at the Grand Hotel, I highly recommend it for your family. If not, you can still visit the hotel for the day. The cost is $10 per adult, $5 for kids ages 5-9 and FREE for children 4 and younger. 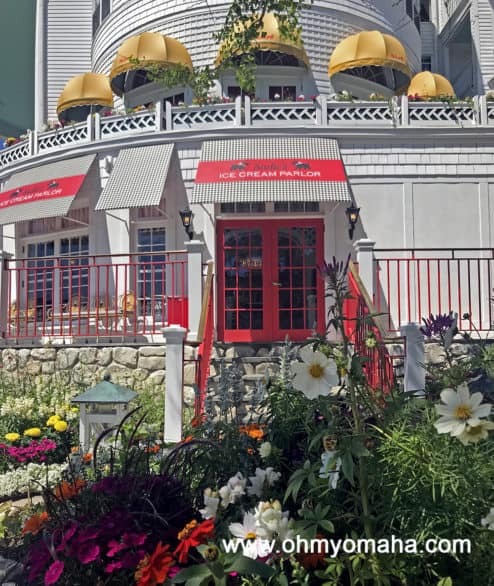 The Grand Hotel on Mackinac Island had free activities on the lawn and on its famous porch. Having said all that, are you wondering about your comfort level at a place like this? Is it too nice? Sure, there’s a dress code for part of the hotel after 6 p.m., and that can be intimidating. Call it “dress up time,” and your kids will get behind the idea. My daughter wore a little black dress and my son wore his First Communion outfit. There are exceptions made when it comes to the dress code, so relax. For instance, I forgot a tie for my son and that was no big deal. Also, my husband was injured and in a wheelchair. Due to his injury, he could not wear his dress shoes. The dining room staff graciously did not make a fuss. 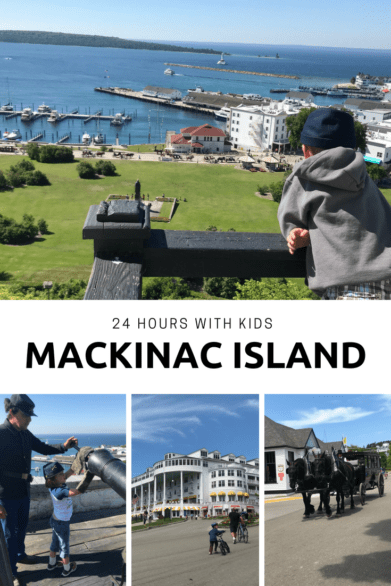 Where: 286 Grand Ave, Mackinac Island, Mich.
Getting there: Most people take a ferry from either Mackinac City or St. Ignace. The Grand Hotel will pick up your luggage from the ferry and deliver it to your room. The hotel also brings your luggage to the ferry for your departure. About tips: Tipping is not allowed at the Grand Hotel, except at the salon. It is expected at most off-site locations like some of the restaurants and at the pool.